Sophisticated systems for intelligent building technology offer the greatest potential for energy savings. Here, the Gira HomeServer is used in conjunction with its flexible operating options for monitoring and controlling building technology. This allows for energy to be managed in such a way that is geared precisely towards the occupants’ requirements. Only using energy when and where it is needed. Due to the intelligent interaction of various functions and devices, as well as time-dependent and needs-based control, the Gira HomeServer does more than just offer greater convenience and security; it also helps to save energy. This saves money and conserves the environment, along with dwindling resources. The system detects when a door or window is opened by means of door and window contacts. 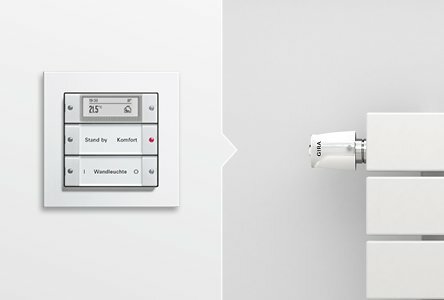 After a defined period of time, the heating is then automatically turned down in the corresponding room. The heating is not turned up again until all the windows and doors are closed. This prevents unnecessary heating, while ensuring that a room is always sufficiently heated at the same time. 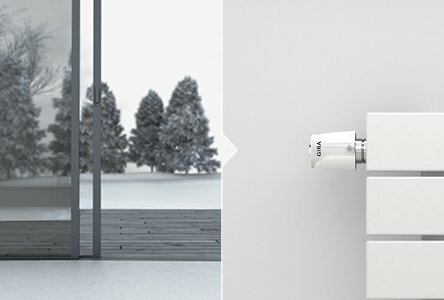 A separate profile that specifies the times at which heating or ventilation is to take place – in the mornings and evenings for the bathroom, for example – can be created for each room. The temperature can also be individually regulated using the Gira touch sensor 3 Plus. The result is temperature control that is economical and adapts precisely to occupants’ needs. This means that heating and ventilation systems never run unnecessarily. With temperature sensors and positioning motors on the heating valves, the system detects whether the flow temperature provided is too high or too low. Depending on the average outside temperature, this can then be adjusted accordingly. Optimum energy utilisation is thus ensured in the entire building all year long, and unnecessary costs are prevented. 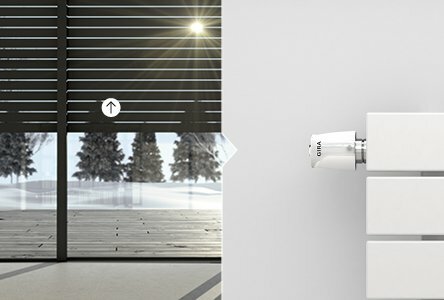 The sun’s energy can be intelligently integrated into the temperature control system by means of the perfect interaction of blinds and heating. In winter, the blinds are raised when the sun is in a favourable position and the amount of heating is reduced accordingly. In contrast, unnecessary energy consumption can be prevented in summer by means of blinds automatically lowering in good time and the air conditioning reducing its output. Presence and motion detectors ensure that lights are automatically switched on just when they are needed. 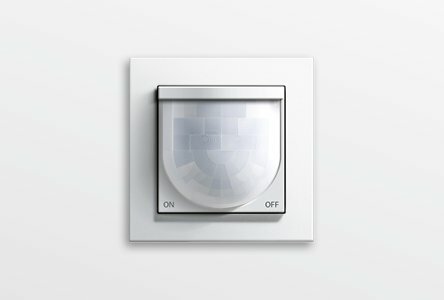 If no motion is detected for a certain amount of time, the lights switch themselves off again. In combination with brightness sensors, it is also possible to provide exactly the light intensity that is actually required. In the entrance area, all the power-hungry devices can be switched off at the touch of a button using the central cut-off function. This guarantees that no devices are consuming electricity unnecessarily. The central cut-off function can also be connected directly to the locking system as an option. 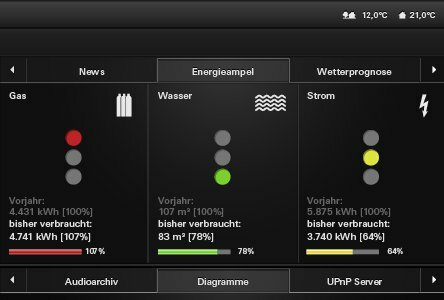 The Gira HomeServer continuously records and stores operating and consumption data for electricity, water, gas or heating oil. Trends can be tracked throughout the whole year by means of clear diagrams. 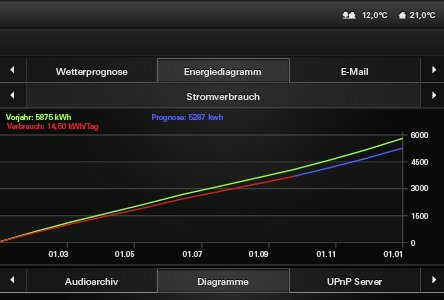 If significant deviations from average consumption occur, this is quickly detected with the energy module. In this way, energy management can be easily optimised and adapted to individual requirements.